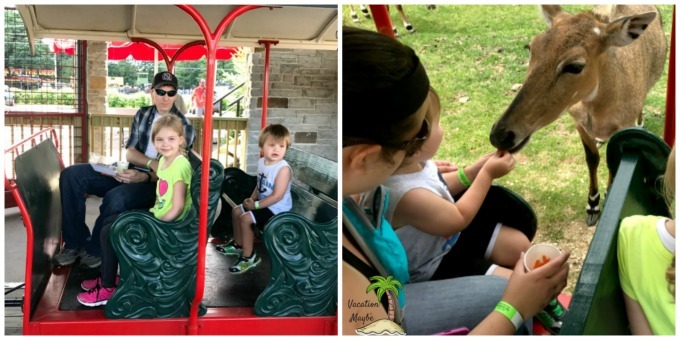 Day trips are a great way to spend time as a family. We love that they can be planned without my husband having to take any extra time off of work. Whether we plan them in advance or, wake up the day off and decide to do something they are the perfect mini vacations. Timbavati Wildlife Park was the perfect day trip destination for our most recent day trip. 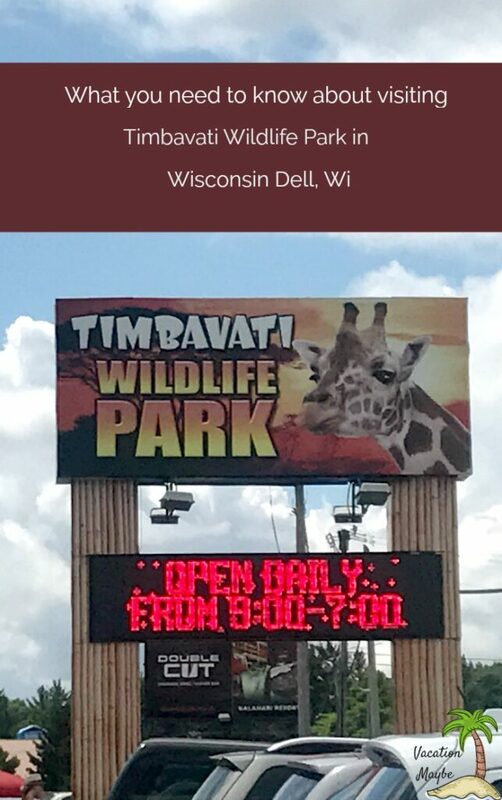 Timbavati is a wildlife park in Wisconsin Dells, Wisconsin. At Timbavati Wildlife Park you can get up close and personal with so many different animals through several different activities. This tower allows you to look over the whole wild life park. The only way to the top is to take the stairs but, it is worth the climb. It’s a great view that helps you see everything and know where you want to go next. In this area, you will be able to get up pretty close to these types of animals. These ones aren’t able to be fed or touched but, you can still get a really close look! In this area of the park, you will find many different types of animals. The main goal of this area is to socialize the smaller animals. So, in order to achieve that, you are able to feed many of them and pet them as well. While you are unable to pet all of them, you can still view them. This building is pretty cool! Before you enter, you can buy a stick of parakeet food. 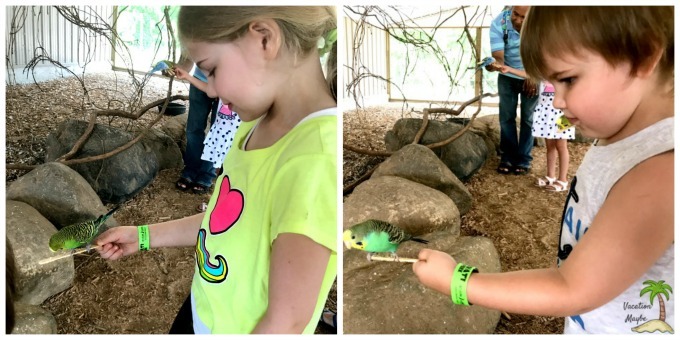 You enter the building and once inside the birds can fly up to you and land on the stick to eat. If they aren’t flying around you can walk up to the closer ones and put the stick near them. Usually, they would step on the stick and you can walk around with them on there. Here you will walk through the wooded area and see an array of different animals. Also, within the Woodlands, you will find the area for the camel rides. Here you will find a couple of different types of cats. We saw lions and tigers! This is a great place to visit for kids who love cats! The train ride is an added cost. It runs about ¾ of a mile long. 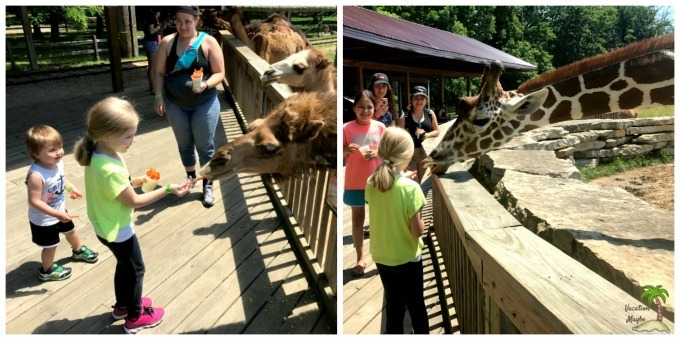 While on the train ride you stop a couple of times to feed some of the animals. One of the stops you get off the train to feed the camels and giraffes. The second stop you stay on the train and have several different types of animals come up to the train and eat from your hands. It is not required that you have the feed to take the train ride but, it does make the stops more enjoyable. Camel Rides are not included in your admission price. 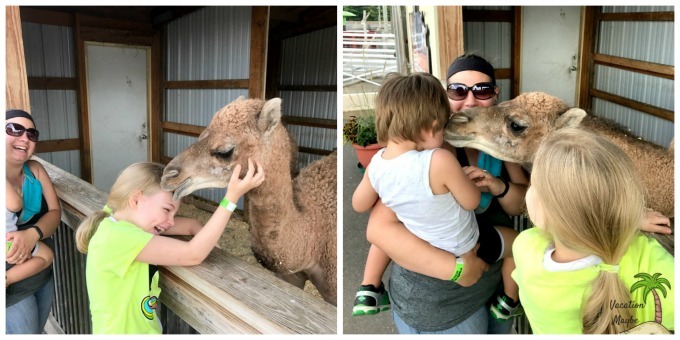 The website says that children ages 2 and under are not allowed on the camel rides for safety reasons and, children ages 3-5 must have an adult with them.While they are said to be there every day, it is weather permitting so, it may happen where they are not available for rides when you visit. Feeding the animals isn’t necessary to visit Timbavati. While there are animals all over the park to feed, you can still walk around the park and see many of them and still get up close to a quite a few of them. Pig races are offered 4 times daily. This part is included in your admission fee. It may seem like an odd thing to see, but trust me, kids will love it! These are included in your admission fee. They also happen 4 times a day and are excellent for those with older children wanting to learn more about specific animals! This is found in the feline area. Outside you can see a couple of different types of cats and inside the building, you can get your picture taken with a baby tiger. Such a neat memory to have! Animal feed is not included in your admission. You can buy a cup of carrots (which is what most of the animals eat) or, you can buy a box that offers a few different types of food. Either option is great. I loved that there were spots all over the park that we could buy feed if we wanted (or needed) to. I suggest that no matter which type of feed you get, that you use just a little bit at every stop. A few carrot sticks or a few the other feeds per stop, otherwise it goes very quickly. If your kids are anything like ours, it will end in sad kids when they get towards the end and find out that they don’t have anything to feed those animals. There is quite a bit of walking involved when visiting Timbavati. Wearing good walking shoes is very helpful. There are about 70 different species in the park with a total of around 400 animals and they are all spread out. For younger children, a stroller may come in handy. As the park is updated and the animals grow and change (along with the seasons) animals may be moved around the park. It is best to ask when you arrive for a better idea of where everything is located. This will give you the best chance of seeing the animals that you for sure want to see. Here is a copy of the map as of our visit to use as a frame of reference. Overall I was pretty impressed with Timbavati Wildlife Park. You can tell they are working hard on updating many things all over the park. We were there a few hours but could have easily spent more time there if it wouldn’t have been so humid the day we went! This looks like a great place to take your family. I know my kids would love it!